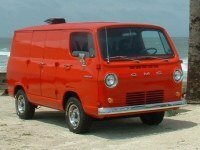 Outlined below is a brief history of the G-Series Vans with a focus on the GMC Vandura. Check out our Van Types and Features / Specs pages for more detailed information. The GMC Vandura (G-Series Vans) were produced over three model generations from 1964 to 1996. The third generation was the longest running and most associated with the Vandura name. The first and second generation G- Series Vans were knows as the GMC Handi-Van or Handi-Bus. The first generation more closely resembled the classic Econoline and Dodge A100 and looks, with the second looking like the vintage VW Bus models. Only minor modifications were made to the GMC Vandura over the years. Primary improvements were made in accordance to evolving safety standards, fuel economy and to improve economies of scale. While minor cosmetic changes have been made over the years to keep up with modern styles, the GMC Vandura retrained much of the same look since the 1970’s redesign. The Vandura and Chevy Vans were discontinued in 1996 and replaced with the Savana and Express.